I'd always wanted to ride the Seven Summits Trail in Rossland BC. I first read about this trail in Bike Magazine a couple years ago as they gave it their Trail of the Year award. My birthday was coming up and it was a no brainer....we needed to ride that on my birthday. Its over 3000' of climbing and 20+ miles of singletrack. We loaded up and said good bye to the coast that had been our companion the last six weeks. We made a stop in Vancouver and found some really pretty country on the drive over to Rossland. 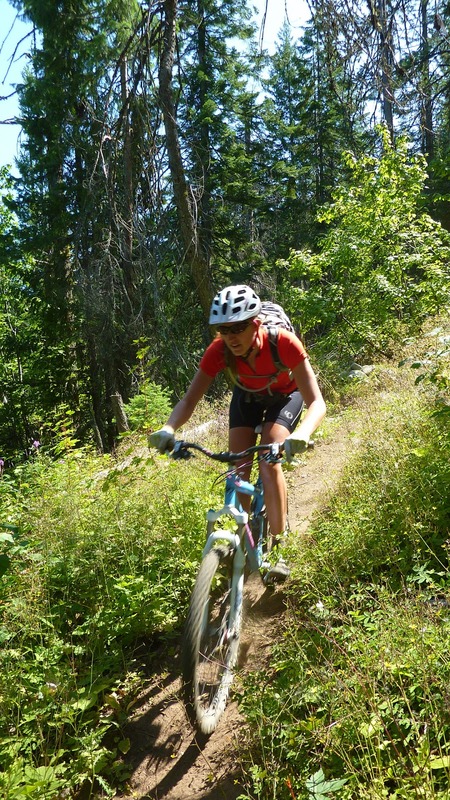 Rossland has billed itself as the Mountain Bike Capital of BC since 1993. It has a fantastic campground right downtown. You can ride right from the campsite and enjoy tons of singletrack along with two city owned mountain bike skills parks. The downtown has everything you need from burgers to bike shops to a brewery. The town is pretty quite though at night but I figured everyone is tired from riding anyway. Talk to the city campground host if you want a cheap shuttle for seven summits. He is definitely a character and nice guy. There are also tons of other trails to ride here other than the Seven Summits. Stop in at the bike shop and grab a map. Rossland found itself in need of a boost after the old economy of the town (mining, forestry) slowed. With a grant Rossland started building and improving trails including the Seven Summits. The town even has a full time crew building and maintaining trails. The local economy has turned farther into tourism and now they are getting herds of bikers in town from Calgary, Vancouver, Spokane and beyond. Its amazing to see how much mountain biking has done to this town. BC definitely "gets" it in terms of what people value in a community. Trails clearly being a top priority here. We met a few people here who would become riding partners later on down the road all over BC. People from all walks of life who share a love of singletrack, beer, and adventure. You know who you are and thanks for the good times!